RENSSELAER, Ind. – For 16 minutes Saturday, Northwestern looked mortal. But for the other 48 minutes of game action at the Rensselaer Central Girls Basketball Regional, the defending Class 3A state champions were a dominant force as the squad captured its second consecutive regional title and a berth in the Final Four. For top-ranked Northwestern, mortality in tournament play meant a pair of first quarters in which the score was close. In its 67-34 semifinal win over Gary West, the Lady Tigers were tied 14-14 after the first eight minutes before going on a 53-20 run to end the game. In its championship game win over No. 5 Mishawaka Marian, Northwestern led 9-6 after one quarter before pulling away for an easy 18-point win. In the title bout, a rematch of last year’s regional semifinal, Northwestern (25-3) was ready for the physical play of Marian. But an early injury brought a hush over the crowd as Lady Tiger starting forward Sarah Heaver dropped to the floor in front of the Northwestern bench, grabbing her right knee. Trainers tended to her and eventually helped her off the floor and to an adjoining training room. Junior Kendall Bostic admitted that it shook the team and took a few minutes to get back into the flow after watching a teammate leave the court. But once they got back on track, the Lady Tigers took control – much like they have done in every tournament game in the last two seasons. After Marian’s leading scorer Makayla Weaver picked up her third foul early in the second quarter, Klair Merrell grabbed a steal, which resulted in a Bostic score. Then Merrell found Madison Layden on a back-door pass – and before Marian knew what hit them, the 9-6 score was 17-8, and then 22-14 going into halftime, with momentum clearly on the side of the Tigers. The second half started much like the first ended – Bostic hit two quick buckets, Ellie Boyer scored and Layden had a brilliant wrap-around pass to Bostic to increase the lead to 32-14 with 11 minutes of play left. From there, it was cruise control and a second consecutive trip to the Final Four. Bostic finished with 16 points, including 12 in the decisive middle quarters. Northwestern was led by the 22 points of Layden, who put the game away with eight fourth quarter points. Merrell added five points and Boyer four as only four Lady Tigers found the scoring column. For Marian (22-4), Mikiya Roby had 11 points to lead the way. Northwestern advances to its second consecutive Logansport Semi-State, where it will face No. 11 Marion (23-4) at 7 p.m. in the Berry Bowl. The South Semi-State in Jasper features No. 2 Salem (24-3) against No. 7 Benton Central (25-4) at 6:30 p.m. 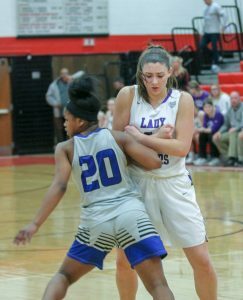 In the Lady Tigers win over Gary West, the two squads were knotted at 16 early in the second quarter – mostly due to the play of Dash Shaw. The 5-foot-6 junior guard for Gary West cut through the Lady Tigers defense and scored the first 12 points for the Cougars. Something that did not surprise Layden. Northwestern stuck to its game plan, adjusted to the play on the court, and shut down Shaw for most of the second (no points) and third quarters (five points). With Shaw out of the scoring equation, Gary West could not find a replacement. By the end of the game, Shaw had 21 points while the rest of the team managed just 13. Meanwhile, the offense for Northwestern heated up. Layden, the program’s all-time leading scorer, dropped in 31 points to eclipse the 1,500-point mark. Bostic had a great all-around game with 18 points, nine rebounds and eight assists. Katie Neher added eight points. This entry was posted in Basketball, IHSAA, Northwestern. Bookmark the permalink.